Our thanksgiving was the smallest we have ever had but it was FULL of all the feels! This year my parents went to be with my Pappap and my brothers had other plans….so it was my little family and my sister’s together and let me just say….we kinda rocked it. The smaller group (four adults and nine kids) meant that we could spend less time prepping food and more time chasing the little ones and more online shopping! It was amazing to still have all our favorite dishes even if all our favorite people couldn’t make it. 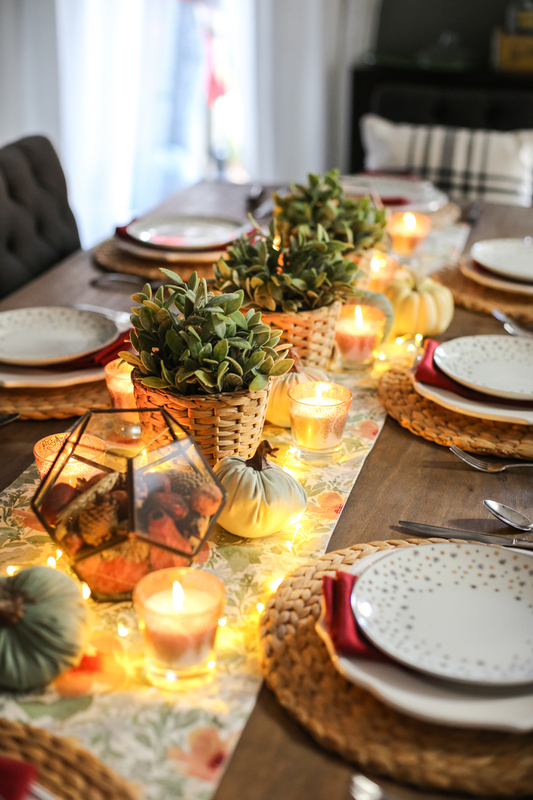 And I thought you would like to see our thanksgiving table….I went with a crisp fall feel….something fresh and still warm! I picked up the table runner on clearance at Target and then added these woven baskets with faux plants to keep the centerpiece low and compact. The baskets tie in with the matching chargers. And the fall infusion came with the fabric pumpkins. I’m always so excited to see those in the Dollar Spot at Target but they sell out quick! 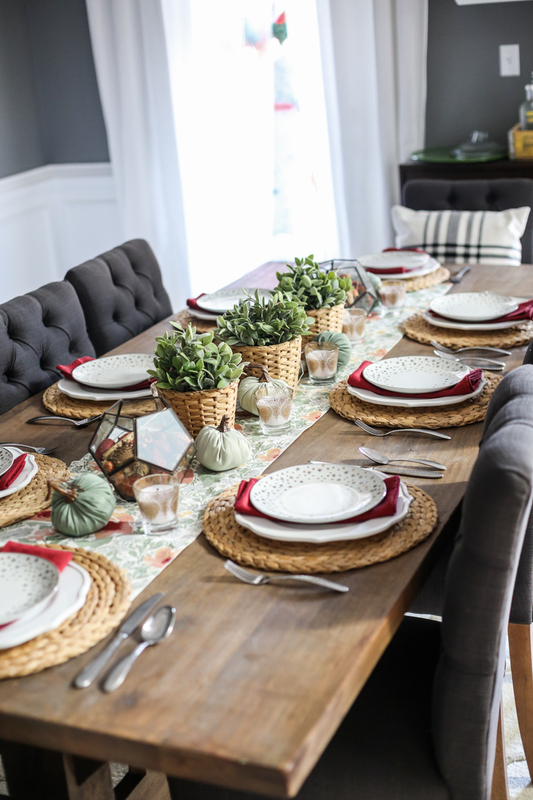 I tied the runner in with the napkins by choosing a complimentary color – that red screams fall to me! Oh and that is a tip for anyone out there still growing their table setting stash….buy white dishes and red accents. White plates never go out of style and make food look so good. 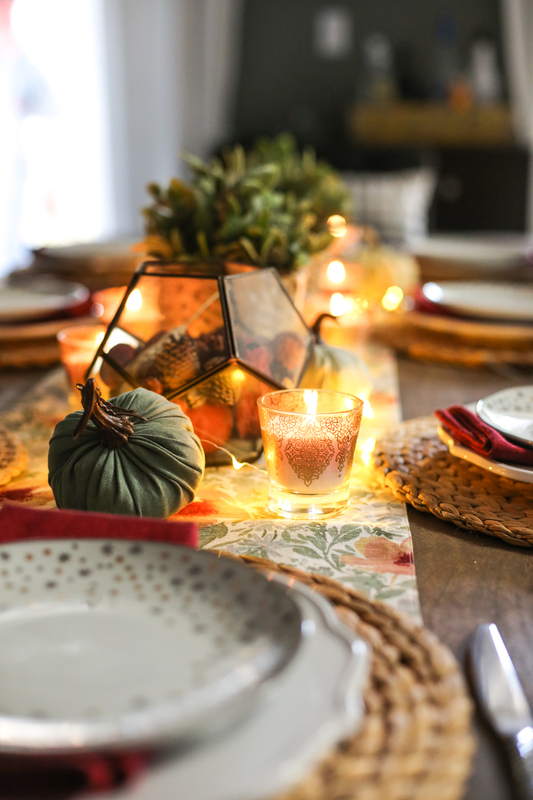 And red applies to so many different holidays that it makes setting the table easy! Red napkins, red accent plates, red votives….they are all a good idea! When it came time for dinner, we upped the warmth by lighting all the candles (which came from the Dollar Tree!) and turned on the amber led lights. Aren’t those votives so cute?! Such a big impact for only a few bucks! Since the table is so long, I also popped those glass terrariums on the end with some scented autumn potpourri mix. Overall the centerpiece was fast to make and easy to talk over – that is what every centerpiece should be! I kept the room decor simple too. I simply hung our Give Thanks banner over the buffet and popped a few pumpkins on there. In general, we do a buffet in the kitchen and everybody brings their plate and drink back in to dine. And if you are wondering if I still love our light fixtures….oh yes….especially during the holidays! We also threw together a kids table last minute and the best part wasn’t what was on top! As for the turkey, this was my second year being in charge of the turkey and it turned out really great! I think it helped to have a medium size turkey instead of a goliath! I used Pioneer Womans citrus rosemary recipe and it was so good! I added extra orange juice and oh man, it was a great pop! Also, I did create that garnish plate with leaves from a japanese maple and butter crisp lettuce and rosemary from my garden! So fun being able to run out and grab whatever I need! After dinner, we broke out the markers and the newspaper ad and we circled all the goodies for Black Friday! Jeremy and I watched the kids while my brother in law and sister headed to Walmart. If you know my brother in law Boots, he is a Black Friday Ninja…..seriously it is one of my favorite quirks about him….he is obsessed with shopping on that day and we get so excited seeing him so excited! It’s like watching a kid at Christmas! All that to say, we did end up buying a few things! One of them is a rug for our living room (this one to be exact because that price was too good to pass up!) and then also this cooler bag. I am also doing quite a bit of shopping today! Here is the list of stuff I am looking for…. AMAZON has a ton of deals all day long. We have our eyes on an air fryer, along with gift ideas for family. You can find all of the available Black Friday deals here. ANN TAYLOR – 50% off everything with code GOPINK. ANTHROPOLOGIE – 30% off your entire purchase (no code required). I’m thinking of this wallpaper for the laundry room! BAUBLE BAR – 30% off everything with code FRIDAY30. CB2 – 15% off your full-price purchase and free shipping on purchases of $29 or more with code SAVE15. CRATE & BARREL – 15% off most full-priced items with code SAVE15. 40% off 150+ furniture items! J. CREW – 40% off your entire purchase with code THANKU. J. CREW FACTORY – 50-60% off their entire site + extra 50% off clearance. Prices are as marked and no code needed. JOSS & MAIN – up to 80% off tons of items site wide! LAND OF NOD – 20% off and free shipping. LOFT – 50% off everything with code FRIYAY. KATE SPADE – 30% off everything with code GIVEJOY. MACY’S – additional 20% off (some depts 15% off) with code HURRY. Free shipping on orders of $49+. MCGEE & CO. – 20% off your entire purchase with code GIVETHANKS. THE MINE – 25% off your order of $199+ with code GREATDEALS25 including free shipping and free returns. OLD NAVY – 50% off your entire purchase thru the end of the day. ONE KINGS LANE – 20% off sitewide, plus free shipping on orders over $100 with code OKLFREESHIP. POTTERY BARN – 25% off most items with code BLACKFRIDAY. SERENA & LILY – 20% off your purchase with code CHEERS. TARGET – up to 40% off all home, with an extra 15% off furniture and rugs with code TURKEY. TORY BURCH – lots of new items up to 60% off. Take an extra 30% off your purchase of $250 or more! WAYFAIR – up to 80% off thousands of items. Click here to see their flash deals! WORLD MARKET – up to 50% off sitewide. P.S. My Canon TS9020 printer(white or red) is only 79.99!! from now until Nov 27 11:59 pm EST. That’s $120 off, or if you like percentages, 60% off ! Get it HERE! For a high chair, I highly recommend the fisher price space saver one. You put it on a chair and your little person can join the family at the table. It works with the tray or as a great booster at the table. It’s only $17 right now at toys r us! I absolutely love your table! Simple yet beautiful! For the Christmas cards you have to purchase this deal from Groupon. I’ve gotten for the last three years and the quality is so good and the turnaround time is great. We buy the one for 100 and it’s so good. Good luck shopping. I use Pioneer Woman’s brine, but I prep and cook it per Alton Brown’s recipe! SO GOOD!